What are Torontonians doing about Basement Flooding? It's a serious problem. Toronto’s July 2013 flood is listed as Ontario’s most costly natural disaster to date (with a $850 million price tag). Although serious, after a similar flood of Union Station in 2012, some internet jokesters photoshopped something we Torontonians could use to laugh our way through cleanup. Still, there is no point crying over flooded stations any more than over spilt milk. Besides, not only subway stations can be flooded. So can homes, your home. Let's think about your personal castle and its foundations; let's talk 'basement.' Here are the latest tips from Toronto's updated Noah about how to keep your basement-ark safe and dry. Taking aboard two of every kind of crawling, flying, and walking critters is optional. What causes basement flooding? Heavy rainfall and sudden spring thaw causes built-up snow to melt rapidly. What Can I Do To Keep My Home Safe And Dry? Keep your basement drains clear. Inspect your weeping tile system to ensure it is not damaged, and properly draining stormwater below & away from the home’s foundation. Repair & clear leaking and plugged eavestroughs & downspouts that don’t properly carry water away from the house. Make sure your lawn has a slope or tilt away from your basement foundation walls. Reroute downspouts so they don’t empty into the sewer system. This downspout disconnection is mandatory. Make sure your eavestrough downspout empties at last 1.8 metres/6 feet from your home. Install soft-surface landscaping (e.g., shrubs, porous paving). Repair all cracks or leaks in your basement foundation. 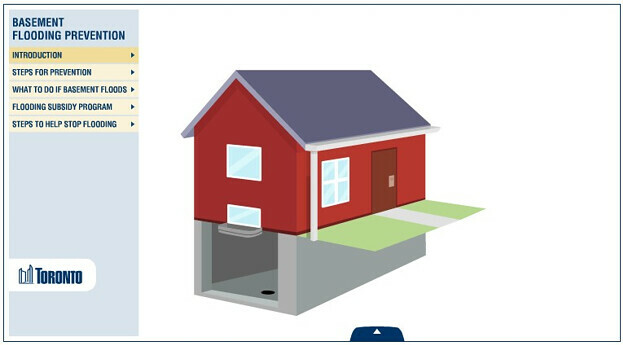 Ensure your connection to the city sewer system has a backwater valve. Check with your home insurer to ensure that you have adequate protection against flooding. Work with your neighbours to prevent someone's broken eavestroughs becoming someone else's flood. Install and maintain a sump pump used to pump water from weeping tile and/or basement drains. Get a building permit when doing sewage repair work to ensure that the work is done properly. For damage caused by the City, send an email to clerk@toronto.ca. Toronto's sewage system is designed to control most storms but not severe ones that flood city streets and home basements. With climate change storms are becoming more severe and frequent. Both the City and homeowners need to take action to reduce the risk of basement flooding. The City is constantly working to improve the sewage system in low-lying flood prone areas. It also offers subsidies. The City of Toronto offers owners of existing homes financial subsidies to assist with the cost of installing certain basement backup measures. A homeowner's best friend, other than Fido, is a backwater valve that prevents sewage backup into the basement. To be eligible for the subsidy a City licensed plumber must perform the work and a building permit is needed. Your front lawn must be unpaved and the downspouts of your eavestroughs must be disconnected from the sewage system. Call #311 or email basementflooding@toronto.ca for more information. Flooded streets and basements are part of the larger problem of global warming. Certainly, we need to think globally and act locally. By becoming more aware earth-citizens beginning with where we live we can recreate our own covenant with the Earth. The future begins now, it's up to us. At work, buildings on our ~70 year old campus are connected to the city's combined sewer system, and had major sewer-backup floods in 1996, 2005, 2011, and 2012 (x2). Each of those floods cost between $25K-$50K for us to clean up, with labour costs, equipment rentals, mould remediation and reconstruction, etc. After 2012, we then spent around $300K to install backwater valves on our sewage outflows (major digging was required, both inside and outside buildings), which stopped the flooding, but also require regular maintenance to be reliable. My estimate would be that we've avoided an additional three floods since that point. Unfortunately, that also means that our buildings are no longer any sort of safety valve for the city sewers, so it increases the likelihood that sewer surcharges will flood out of others' drains in the neighbourhood. It seems reasonable to conclude that a combination of changing weather patterns, increased development and runoff into the combined sewer system, is really overtaxing the city infrastructure. The city is clearly playing catch up to the problem, but everything that can be done will ultimately impose cost on property owners.